Zanzibar is the semi-autonomous part of Tanzania, with the blissful Pemba Island a treat for fans of white beaches and clear, blue water. 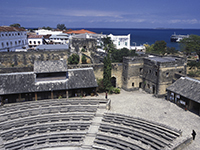 Other highlights of Zanzibar include the House of Wonders and the Old Fort of Zanzibar. Flying to Zanzibar is the only viable form of transportation from the United Kingdom, with flight times, on average, taking around 15 hours. The time difference in Zanzibar is two hours ahead of British Summer Time and three hours of Greenwich Mean Time. This should not result in major changes to your diabetes management, but you should consult a member of your diabetes team if you are uncertain regarding medicating in Zanzibar. Temperatures can vary between 15°C-26°C throughout the year, but the average temperature often stands at 20°C, a prime reason for the tourism in Zanzibar. On occasion, the temperature can soar to around 30°C, and insulin takers should be aware that this kind of heat can enhance insulin absorption. As a result, blood sugar levels should be attentively checked, while you could consider reducing dosages if planning periods of physical activity. The currency used in Zanzibar is the Zanzibar Shilling. There are many ATMs available, as well as Bureau de Changes for currency exchanges, while credit and debit card payments are mainly accepted in major shops and most hotels and resorts. There are no mandatory vaccinations to enter Zanzibar, however several are highly recommended. You should consult your doctor eight weeks prior to your departure in order to receive the vaccinations in time. Some travellers are also recommended to receive vaccinations for other diseases, including hepatitis B and rabies, which can be carried by dogs, bats and other mammals in Zanzibar. You should also talk to your doctor about how to prevent the contraction of malaria while travelling. Your doctor may prescribe you medication before, during and after your stay and will advise you on what to do to avoid getting malaria. UK citizens with diabetes will not be entitled to any free medication services while in Zanzibar. Securing comprehensive medical insurance will be essential in order to obtain even basic treatment. Diabetic medication is available in Zanzibar, but payment will be required from all pharmacies. Blood and urine testing equipment is available in Zanzibar, with the ‘OneTouch’ brand of blood glucose meter the most common. Public hospitals do not have emergency telephone numbers, but several private hospitals will and you can get the telephone numbers from newspapers or telephone directories. You should note which syringes are available in Zanzibar, with U-40 and U-100 syringes most commonly used. What sugar free drinks are available in Zanzibar? A variety of soft drinks such as Diet Coke and Diet Fanta are available.